The second section of this unit deals with the domain and range of a function or a relation. It also focuses on the two types of restricted domain: (1) restrictions of an infinite set of numbers, and (2) restrictions of a few points. Some functions cannot take certain values as inputs, and this section details how to find those values. Domain is the set of all the inputs of a relation or function. Range is the set of all the outputs of a relation or function. (0, 1), (1, 2), (1, 3), (4, 6)? Answer: The domain is x = 0, 1, 4 . 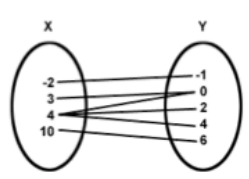 Example 2: What is the domain of the mapping diagram? 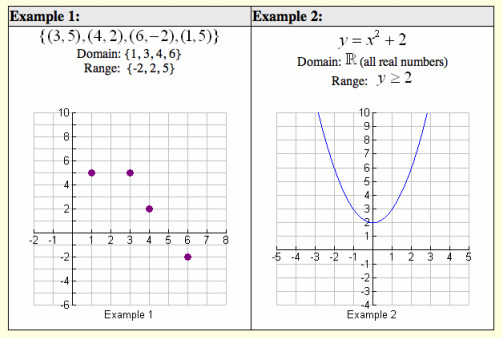 Find the domain and range from a graph in interval notation. If you don't remember interval notation, click here. The domain of a function that is not defined for all real numbers. Most of the functions we have studied in Algebra I are defined for all real numbers. But some functions have restrictions on their domain (Meaning that some inputs do not exist). (2) Restrictions of a few points (i.e. 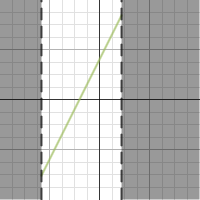 inputs that would give a zero in the denominator). Square root signs restrict an infinite set of numbers, because an infinite set of numbers make the value under the sign negative. To find the domain of a function with a square root sign, set the expression under the sign greater than or equal to zero, and solve for x . A variable in the denominator of a fraction can restrict 1 or a few points, because a 1 or a few numbers make the denominator equal to zero. To find the domain of a function with a variable in the denominator, set the denominator equal to zero and solve for x. Don't forget, this section also deals with ranges of functions and relations. While domain is the set of inputs of a function, range is the set of outputs. Both are important to mention when describing a graph or function. Range - The set of all outputs (y-values) of a relation or function.